Some parts of these two French cities haven’t changed for centuries. This summer, during our five days in le Midi (the south of France), my husband and I spent an afternoon in Avignon. Arriving after lunch, we spotted and entered a parking garage near la gare with only moderate difficulty (having to back out of an unmarked a wrong entrance, and, with embarrassment, forcing the car behind us to do the same). Heureusement, I was driving. It was a hot day and, during its July festival, the town was crowded with visitors from France and elsewhere. 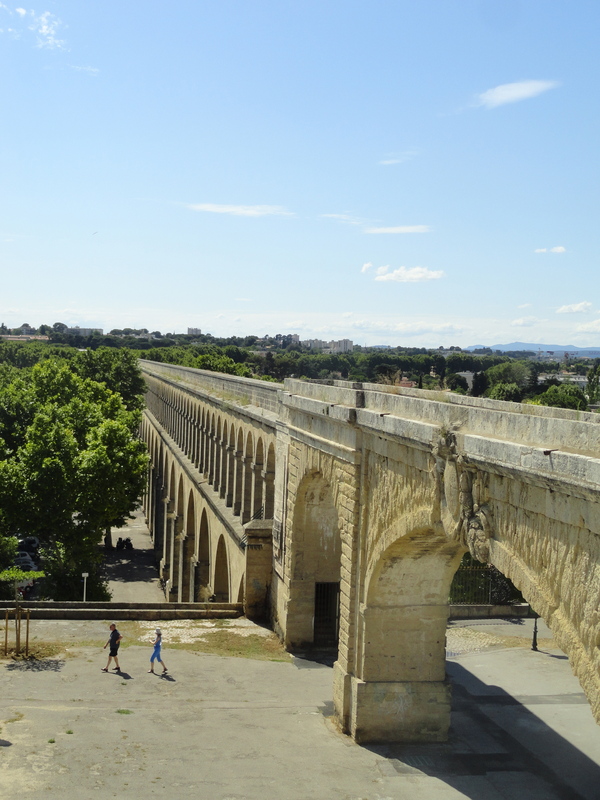 But perhaps because, as a student, though I’d lived just over ninety kilometers away for almost a year, I’d never ventured over to Avignon, I wanted to see le pont d’Avignon and look around — as a tourist. 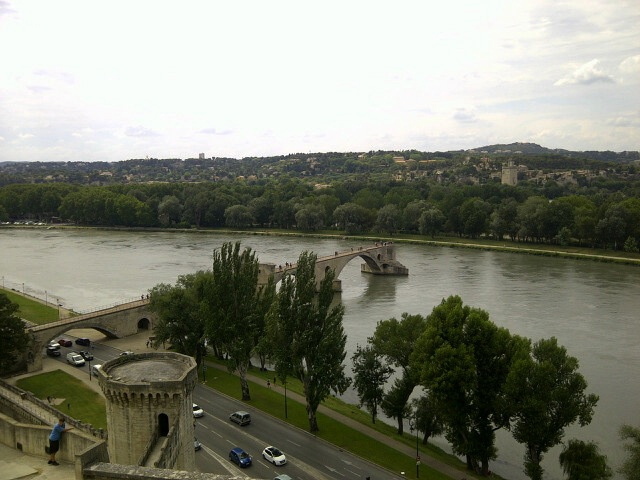 We climbed les escaliers to this view of the pont, then saw the Palais des Papes on our way to Place de l’Horloge. I wanted to visit another famous town in the region, Nîmes, but because we’re Americans (and therefore, had planned to do more than time would allow), we had to skip it and head over to Montpellier, happily* arriving there at cocktail hour. At my request, our agent de voyage had booked us at a mid-priced more-expensive-than-in-the-U.S. (but still perfect for our budget) Best Western hotel, Le Guilhem, which we loved once we found it. ** However, with no hotel bar evident, we set out à pied to find some alcohol a nice restaurant. As luck would have it, we found one right next to our hotel on Rue Jean Jacques Rousseau called Le Petit Jardin. Malheureusement, c’était complet (full — although it didn’t look that way). Undeterred (but unhappy that our agent hadn’t found and booked it, since we were celebrating our wedding anniversary), we got a table at another restaurant, Volodia, on the same rue, and ordered champagne. The following day, a Friday, we did some exploring. Some parts of Montpellier were just as I recalled, and some parts of it were quite different. We walked through the campus where I had attended classes and had studied at la bibliothèque. We visited nearby Palavas-les-flots and found my old (and only slightly changed) apartment building. 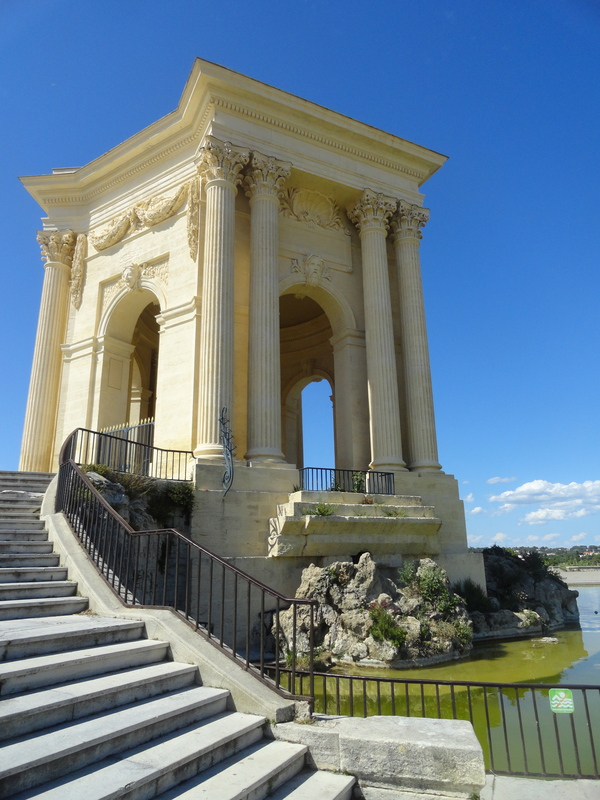 We toured Montpellier some more (mais pas en voiture) and learned a little of its history. It was a strange but wonderful feeling to be in a place where I had missed mon ami. 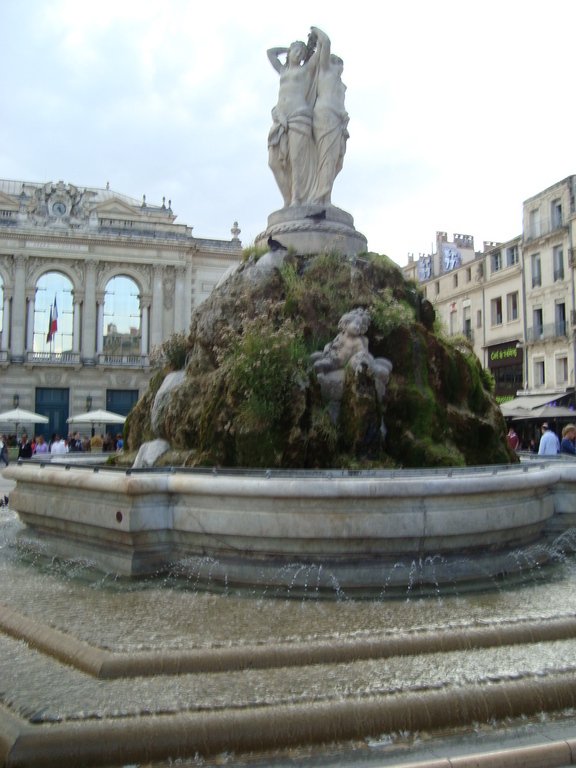 In my upcoming novel, the protagonist and her girlfriends get around Montpellier and its environs very well. 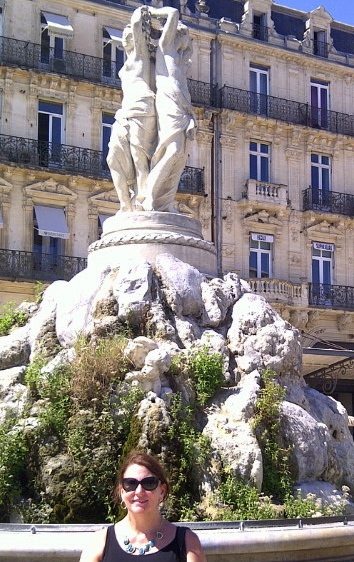 They often meet at a café in the centrally located Place de la Comédie, or at the statue of Les Trois Grâces in front of the Opéra National de Montpellier. All of which are still there — though somewhat changed. * at heure de pointe (rush hour)! As we inched along in a traffic jam from the autoroute, a siren-blasting emergency vehicle passed us and several other vehicles with difficulty, due to a complete lack of room.